For our long-term residents, our Restorative Nursing staff creates an on-going, individualized program designed to enable our residents to retain as much independence as possible. If end-of-life care is needed, our nursing staff works closely with contracted Hospice providers to provide palliative care with the utmost dignity and respect. 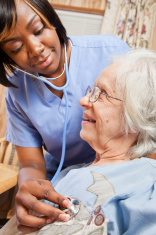 To learn more about our nursing care, please Contact Us or call 330-372-1960. We welcome the opportunity to serve you and your family.